What is modest dress? Is it just a veil over the head and long sleeves? Sign of religious oppression, or expression of sartorial freedom? Limited to women, religious people or open to all? These questions, and more, are answered below. The English word "modesty" comes from the Latin word "modus," for "a measure." Modesty therefore has a connotation of "keeping due measure," or doing things without too much fuss or ostentation. Humility, and avoiding boasting or self-aggrandizement, are also implied in the word modesty. All three Abrahamic religions have traditions of modest dress, usually for women, but for men as well. Orthodox Judaism has a concept called "tzniut," or צניעות, a number of laws that govern modest conduct, contact between the sexes and women's dress. 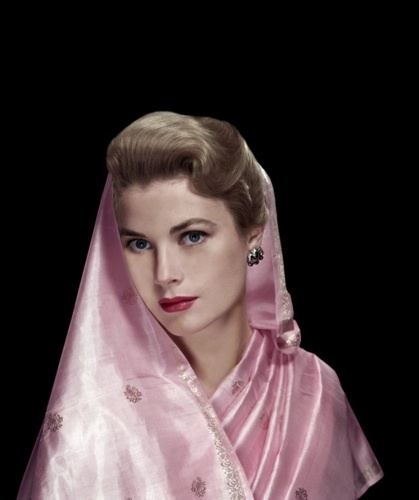 Accordint to tzniut, married women are required to cover their hair, often with a headscarf, snood or sheitel. Men are required to wear shirts with sleeves; some sects require men to wear something on their heads at almost all times, save bathing and sleeping. The Christian bible exhorts women to "adorn themselves in modest apparel, with shamefacedness and sobriety, not with broided hair, or gold, or pearls, or costly array" (1 Timothy 2:9-10). Pope Pius XII stated that women should cover their upper arms and shoulders, that their skirts should cover at least as far as the knee, and the neckline should not reveal anything. 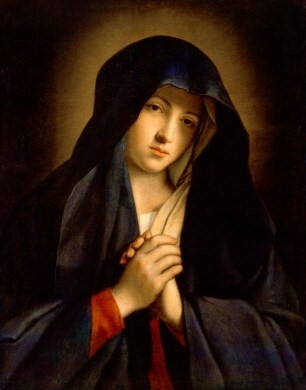 Pictures of the Virgin Mary usually show her wearing a blue mantle over a red, long-sleeved garment. 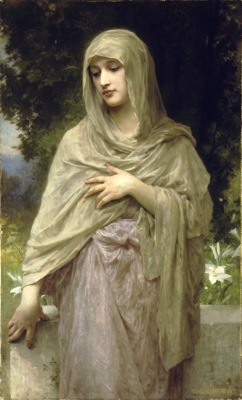 In some paintings, Mary also wears a light veil under the mantle. Sometimes, the Virgin Mary also wears an outfit similar to a nun's habit, an outfit which covers everything but the hands and the face and aims to keep women modest, pure and devoted to God. Traditional Christian communities, such as the Amish in Pennsylvania, put great emphasis on concepts like Demut and Gelassenheit (humility and calm/composure/submission, roughly and respectively). The Church of Latter-Day Saints has similar rules governing dress, stating that "modesty is an attitude of propriety and decency in dress, grooming, language and behavior." Men and women are exhorted to dress in gender-appropriate clothes, which do not show too much skin. Islam has a long tradition of modest dress, especially for women. Muslim styles of modest dress are called hijab, or حجاب in Arabic. Traditional Muslim dress styles cover every part of a woman's body save the face and hands, since the Quran instructs that women "should not display their beauty and ornaments except what (must ordinarily) appear thereof" (24:31). Different Muslim traditions, and countries, interpret this directive differently. The common denominators between these three religions appear to be: a focus on women's modesty, covering the hair and concealing the body, especially parts which could sexually excite strangers. There is also an element of interpretation, since being modest, or humble, is inherently subjective. In this day and age, modest dress is sometimes used as a shield, by traditionalists, against trashy and worldly influences. However, modesty is not an idea owned by religion. Some people dress modestly out of personal preference, shyness, personality or protection. When my mother was growing up in Detroit, Michigan, women dressed to look inconspicuous as a rule. Detroit was and is a dangerous city, whether you dressed like Liza Minelli or a schoolmarm. Why draw attention to yourself? Women wore mom jeans, men's shirts, slacks, flat soled shoes, anything in dark blue, brown or another drab color, and any clothes that would allow you to move and move quickly. Men also dressed to blend in, since looking tough could be more trouble than it was worth. Modesty may have been a result, but the cause was crime. In places where modest dress is tradition, men and women often dress unostentatiously merely to conform to what seems normal. The outfit's color(s) must flatter my complexion. My arms must be covered to the wrists. The neckline must show nothing below the collarbone. I'd like a scarf/hijab/mantle in a bold pattern. I'd like a dress that is both modest and breathable. How else will I survive the summer? I'd like a skirt that looks slimming. Just because I cover up doesn't mean I have to look fat. For now, don't worry about being selfish or about budget. It's actually more selfish to waste money on something you don't want, whether that money is yours or someone else's. After brainstorming you're free to return to reality. This might take 20 or 30 minutes, but you'll be glad you did it once you're finished. Now––where can you buy these fabulous things you're looking for? The obvious answer is eBay. Whatever you're looking for is probably on there. Caveat emptor, though, and be sure to check out the ratio of positive to negative feedback! If there is a large department store in your area, try to find a shop like Macy's or Nordstrom, with a large selection and a helpful staff. They may be expensive, but good service can mean the difference between a good and bad shopping experience. Second-hand stores often have modest clothing, though since they're second-hand, you can only buy what's there; you can't "order" more of the same type. If you're looking for formalwear, check out Beautifully Modest. The name is apposite; it has some absolutely gorgeous formal, semi-formal, wedding and day dresses. Return to Enjoy Your Style's Dresses section. Return to Enjoy Your Style's Gender Studies section.